Magistrates receive various Judicial updates, corrections and guidance from the Sentencing Council or their Justices’ Clerk most of which arrive in electronic format either Microsoft Office Word or Adobe PDF format. We want to add these into our Sentencing Guidelines App either as a general reference of useful resources or specifically in support of specific types of offence. You can add most types of document into the App including scanned documents or pictures, Microsoft Office Word and Excel or Adobe PDF documents. To add your own documents into the “My Documents” section of the App, you need to use iTunes to select your documents and Sync them to your iPad device. Connect your iPad to your PC using the white USB cable and Open iTunes. With your iPad connected to your PC you will see the device appear in the menu. Tap the iPad or iPhone icon. This will open your device within iTunes showing the Summary page. You can use this page to manage iPad or iPhone backup, software updates and iTunes behaviour. Select the Apps button in the side menu, then scroll down iTunes using the scroll bar at the far-right edge. Scroll down until you see the File Sharing section. Tap the above Add file button to select documents to Save into My Documents. From the Add dialogue box, browse to the local folder where you’ve stored all your items. Highlight all the items you would like to add, and click Open. Your items are then copied into your iPad > Sentencing Guidelines App. And you will see them in the Sent Guides list as before. On a Windows PC, the process is slightly different. You cannot add an existing folder structure using the ‘Add File’ button. You need to browse to your folders within the file explorer, and then drag and drop them into the app. Once the files are in the app, the folder structure has been carried over. You can also manage the folder structure within the app itself by pressing the ‘Edit’ button (1), which enables you to perform a number of actions. For example, in the following image I have a file that has been placed in the wrong folder (2). Upon clicking the ‘Edit’ button we have the option to Delete (1) or move (2) any give file. To delete a file, simply tap the minus button next to the unwanted file and then tap the subsequent delete confirmation (which provides a good deal of security against deleting a file by accident). To move a file, simply hold down on the move icon next to your chosen file (triple lines) and drag the file down to the correct folder. Release the icon to insert the file into its new location. When you are finished moving/deleting files, simply click ‘Done’, which has taken the place of the ‘Edit’ button. Sentencing Guidelines also enables you to create folders from within the app itself by clicking ‘New Folder’ next to the ‘Edit’ button (1), giving the folder a name of your choice (2) and then clicking ‘Add Folder’ (3) to add the new folder into your current My Documents archive. You add files to this folder using the same method as with previously existing folders. Back in iTunes, you can also Download files from your iPad (such as judicial updates you inserted into the app from an email) onto your PC or Mac. To copy items from your Sentencing Guidelines App My Documents folder back to your PC or Mac, highlight the file(s) and tap the Save to … button. Hold the keyboard Control button and then click on each of the files you want to copy. Then tap the Save to button. Select a folder location on your local computer to save these files. 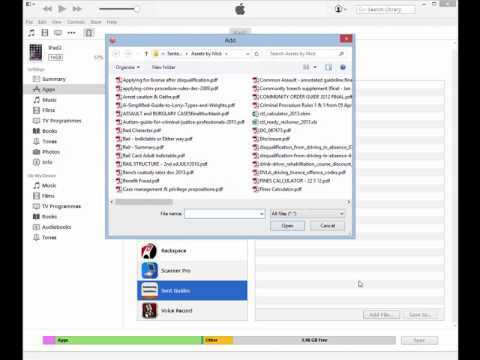 This is a short YouTube demonstrating how to manage adding files and resources into the App using iTunes 12. Create a folder on your PC (such as in Documents) and Save or copy your useful Court documents into this folder. It is a good idea to use the same folder for all your content so that if you remove the App you can quickly reload all of your documents. Tap the play button below to watch a YouTube demonstration of adding documents into My Documents.